The Oolong tea is one of the most fascinating teas. It is complex on the aroma, taste, color and smell. There are different oxidation degrees for the Oolong tea. As the oxidation increases the color, flavor and aroma also increases. Note:Traditionally the tea oxidation is called “fermentation”. Previously I had the word “fermentation” instead of oxidation in my blog and this was deliberate for traditional purpose. On the first Oolong brewing lesson I got (almost 30 years ago) the tea master insisted on the word “fermentation” and not oxidation. Technically is oxidation, traditionally “fermentation”. The Oolong is one of the most famous teas in the world. It is made with the leaves of Camellia sinensis.. The name Oolong means “black dragon tea”. The main sources of the Oolong tea are China in the Fujian province and Taiwan. 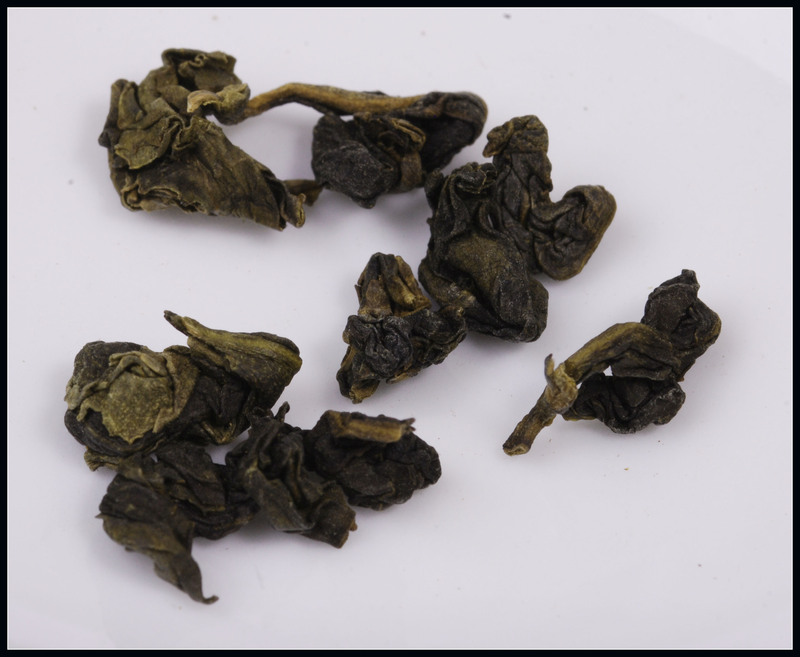 The top quality Oolong teas are very expensive but they bring some flavors and aromas that are priceless. Most of the time the price is associated to quality. This doesn’t mean necessarily that a very expensive tea will be more enjoyable than a lower priced tea. The Oolong teas are usually sold in 50 grams( 1.5 oz) packages in China and 125 grams (4.5 oz) in the US. One of my favorites is the Guan Yin from Fujian,China. The Guan Yin tea is brown green. The leaves are twisted and very solid. They will open nicely when put in hot water. The tea color is yellow. Here is a traditional brewing ritual. 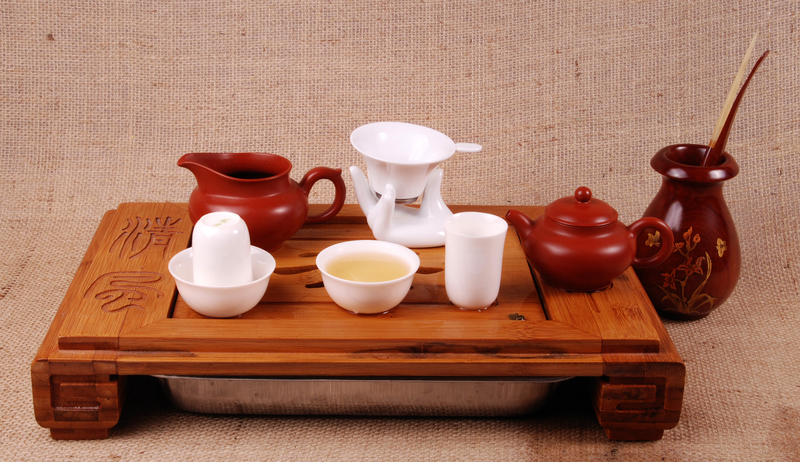 The typical tea ritual is the Gongfucha or simply Gongfu, that has several variations. 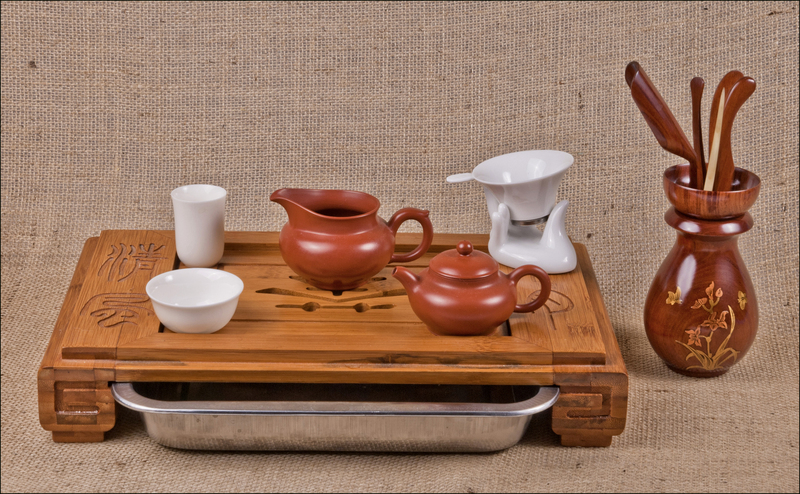 Here is one: the set up is made on the top of a a wooden or bamboo tray that has a metal tray under to collect the water and the tea disposed during the brewing. The teapot, decanter, filter, drinking and sniffing cups are put on the top. The typical Oolong tea set. On the tray clockwise from the rear left the sniffing cup, transfer pot, filter, teapot and drinking cup. The teapot (gaiwan) and transfer pots are made of clay or glass. Some teapots are made as crafts and are signed by the artist sometimes commending prices of hundreds of dollars. The drinking and sniffing cups are usually made of white porcelain with or without design. The purists prefer the true white cups. The tools as observed on the side are composed of: a fine straw shaped tool to unplug the teapot when leaves clog the orifice; a measuring spoon for the leaves and to transfer them to the pot; a tongue to handle the cups after washing with hot water or tea; a spoon to remove the tea leaves from the pot and finally the top of the tea tools holder is used as funnel to direct the leaves to the teapot.The tools are made of wood, steel or bamboo. First hot water is used to wash the teapots and cups. The water is removed from the teacups with the help of the tongue. The “funnel” is put on the top of the teapot and the measured tea leaves are added to the pot. Water at 180 to 190 F is poured to the teapot until it overflows, then teapot is covered and additional water is added to the top in order to uniform the temperature inside and outside the teapot. The first brew washes the tea leaves; the first tea is used to wash the cups and the transfer pot. Now the first tea is brewed to drink. Hot water is added to the teapot, the lid is put and tea is stepped for 2 minutes; then tea is poured through the filter to the transfer teapot. From the transfer teapot the tea is poured to the sniffing cup. The sniffing cup is covered by the drinking cup and both cups are quickly inverted. The sniffing cup is removed from the drinking cup. The Oolong tea remains in the drinking cup. The sniffing cup is sniffed to enjoy the delicate smell and aroma of the Oolong tea. Soon the drinking cup will be taken to savor the tea. Here is the tea set with the first brew of Oolong tea. One sniffing cup is already separated from the drinking cup and the other is ready to be removed. The drinking cup has the formidable tea to be enjoyed.